KitMonsters – Matt Black - Coldcut. The music makers’ guide to making music. As Coldcut, Matt Black and musical partner Jonathan More have been creating and discovering all kinds of out-there, experimental dance and electronic music for more than 20 years. From remixing Eric B. and Rakim to turn Paid In Full into a global smash in the late 80s, to launching the pop careers of Yazz and Lisa Stansfield, and working with rappers such as Roots Manuva, Coldcut’s work has blended instinctive pop sensibilities with a techno-literate DIY ethos to change the musical landscape for the better. They founded leading electronic music label Ninja Tune, they’ve designed VJamm VJ-ing software and are launching the Ninja Jamm app soon. Matt told us about his journey through music kit and gave us a preview of Ninja Jamm’s features. We can’t wait for the real thing! Matt teamed up with Jonathan More in the mid 80s, when both were DJs on the rare groove scene and became pioneers of hip-hop and electro. Their first joint endeavour, the Solid Steel radio show, has been running ever since, and they have created a raft of ground-breaking musical cuts. They decided to set up Ninja Tune in 1993, after a trip to Japan and are renowned purveyors of innovative, eclectic and unforgettable sounds. Matt welcomed us to Space Lab, his studio and nerve centre in London, and we asked him what exciting projects he is currently working on. I split my time between working on music with Coldcut, having some input into the label Ninja Tune, but mostly that’s taken care of by our wonderful Ninja tribe, headed by Peter Quicke, and things like Ninja Jamm which is a software development, plus multi-media research and audio-visual software performances, developing tools for that, which is my particular interest. So we do all kinds of work here. Matt has seen, and helped create, huge changes in music technology, and we asked him to tell us about his tools and kit in the early days, as well as his latest gear. The landscape of musical equipment and the whole environment has changed immensely in my lifetime. I’m actually 50 years old so I started messing around with synthesizers and computers in the mid-70s and I built my own synthesizer with a friend out of a kit plan in Practical Electronics, I think that was the magazine. Maplins was around then, which is where we bought a lot of the components. Going to university I got interested in DJ-ing, in learning to scratch and mix, and so that led on to what you could call “turntable tricknology” - mixers and decks as creative tools, but I was always very into the tech side of things as well. I think that gave me a sort of leg up perhaps compared to other DJs, because I knew what a multi-track was, I knew what an echo chamber was and so I was able to get various bits of gear, and plug them up and sort of add those on to DJ-ing, to take it to another level. Luckily for Matt and Jonathan, the gear revolution was starting to happen just as they were starting to make music like their smash hit remix of Eric B. and Rakim’s “Paid in Full”. 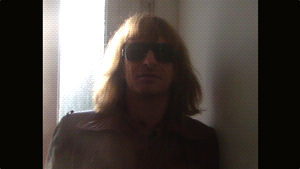 Around the time Coldcut started, technology was really exploding, especially for music, the advent of cheap sequencers and samplers for example, the Atari computer with sequencers. We used C-Lab Creator - Cubase and C-Lab (the forerunner of Logic - ed) were the main ones around at that time. And samplers, everyone else had an Akai, which was probably the industry standard kind of cheap sampler. We had a Casio because they gave us a free one. And also a Casio drum machine which you can hear on some of our old records. You can glimpse some of their set-up in this video of Doctorin’ The House which was a top ten hit in 1988 and features lots of samples. I’ve always been really into the kit, and I think with my background in computing, it was pretty easy to see that things were just going to get bigger and better and faster as technology snowballed, and that brings us to today when really one can have hundreds of thousands of pounds worth of equipment, which previously would have had to be in hardware form. It was very expensive, took up a lot of space, always going wrong. All that power, all that creative technology, can now be made available on a laptop or on an iPad, on a portable device in the form of software. And I think that’s a wonderful thing. Matt has an open-minded attitude towards gear, rather than insisting on the superiority of some formats over others. I don’t get involved in holy wars, as they’re sometimes called, between what’s best, analogue, digital, hardware, software, to me they’re all just useful tools. You know, we made our first record using a cassette deck and turntables, and that started Coldcut so we kind of proved that we can do it with any tools. However, I do think it was a great breakthrough when this cheap technology became more widely available. Because samplers have been around for quite a long time but a Synclavier used to cost a couple of hundred grand so obviously that wasn’t available to most people, me included, and the kind of musicians who could afford that tended to make quite boring music. With some honourable exceptions - Art of Noise deserve a mention there. The democratisation of music-making through cheap technology was a massive factor and of course that’s still rolling on today and it’s something that, with our app Ninja Jamm, we’re still pushing as well because it’s about letting people have access to the fun of making music, making art, playing with sound, without any artificial barriers. Matt’s first love was computing, and he was one of those who saw the possibilities of information technology quite early on. In the 70s I got interested in computers and I read a book called The Shockwave Rider by John Brunner which was the first sort of cyberpunk novel, if you know that phrase. And it really turned me on to computing. The other book was The Selfish Gene by Richard Dawkins, which really had a massive influence on the way that I saw the world. I was very interested in science and biochemistry and genetics, and that book kind of made the connection for me between genetic code and digital code, and also the idea that you could use computers to model behaviour and to make games on. So this was all quite heady stuff in the 70s for a spotty teenage youth, and I really got quite drunk on all those ideas, and so I taught myself to computer program, because this book, The Shockwave Rider, sketched out that the future was going to be about computers and networking. I went to college, I did a biochemistry degree but in the end I ended up doing a computing option and I got a job with a computer company, Logica, in London, after I finished my degree. In the comms department. And I remember, oh it always sounds so old school now, but a guy showing me video playing, from a record, what looked like a record. I went wow, you can store a video on a record! And he said, yeah, we can send it down a telephone line. I said how do you do that? He said well we just send the parts of the picture that changes so this is video compression. This was 1984 and these ideas were, you know, really cutting-edge. At first, he was only aware of the possibilities computers offered in terms of graphic art and communication. I got very inspired and excited by the possibilities of using computers for creative purposes. I remember at Logica one day the guys set up a camera, and it was just a black and white camera, and they took three scans of a colour painting, using three filters, and then built it up on this early computer graphics device, as a colour picture, I asked why are you not using a colour camera? They said well we can’t afford one because they’re a hundred grand. But a black and white camera’s cheap, and by doing three scans we can build up a colour picture using a black and white camera. I thought that’s clever, that’s a hack. But the potential for making music with modern technology was what ultimately appealed, and Matt has experimented with plenty of different kit. Getting into synthesizers in the 70s, it was well maybe I could make music without having to learn to play the bloody piano, which my sister was doing, it looked a lot of work. And quite a large part of it came out of being lazy and just wanting to save myself time and yet get the result. In the end it didn’t save any time but it provided a way in for me which I’ve used and bolted various things on to, to sort of make my own, I suppose. So laziness and frustration with the limitations of not being able to play, of not being some amazingly great rock musician who all the girls love. Those can be good motivations for pushing one forward, so definitely don’t forget about using the negative, what might be labelled as negativity, as a positive fuel sometimes. Matt has seen some amazing changes in technology, as well as developing his own, and talked us through some of his favourite kit. We’ve even got some samples for download, that he made using a rare prototype VCS 4. Coldcut have always been about mixing things, and that means mixing analogue and digital, old and new, and I like to keep abreast of all the new stuff that’s coming out, but I do have old favourites as well. 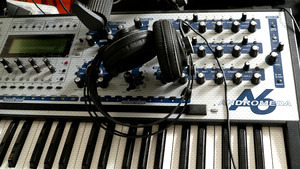 Having got into messing around with synths and electronics in the 70s I have a definite love for analogue synths. And I’ve got a small collection of them, I haven’t gone overboard for it, mainly due to reasons of space! I’m a fully paid-up worshipper at the Church of Roland and have a reasonable collection of Roland tackle - 909, 808, 303. And I’ve always had a fondness for Korg. My first proper synth was an MS-10. I’ve always liked Korg’s slightly leftfield approach, they’re not as big as Roland or Yamaha perhaps but they are a great company. I notice that they were early in getting their software onto the iPad and stuff so they’re an innovative company. Also there’s a lot of kind of weird-arse machines out there which would totally be a whole career in itself just collecting them and I came across a Russian analogue synth last time I was in Russia - there’s some good machines there. I think really one could make a great track and get a great sound out of anything. You could get it out of a cup and a spoon, you can get it out of an app, you can get it out of a rare Russian synthesiser. It’s not what you’ve got, it’s how you use it. And I think there’s a lot of truth in that - we made our first record on turntables and a four-track cassette. Matt told us he sold some of his best synths to Aphex Twin as he’d enjoy them more! He still has an extremely rare VCS 4 in his studio though. 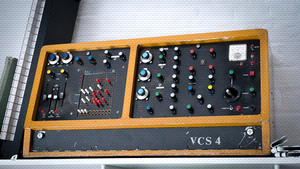 It’s a 1969 analogue synth by Electronic Music Studios, a UK firm, but the model never went into full-scale production. Matt found it surprisingly close to home. When I called EMS and said I had a VCS 4, they said “Is it the cream one or the mustard one”? There were two prototype one offs. Mine is the mustard one, pretty much like a VCS 3. I bought it round 2000 for £300 from a guy in a tower block near Ninja. He fired it up recently and recorded some VCS 4 samples “as a present to all you electronic fiends”. Just click here to get them. Amazing stuff! 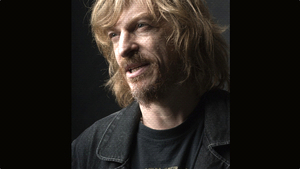 For Coldcut, Matt is always mixing and matching the best of the old and the new. Turntables are still a wonderful direct instrument for the DJ to manipulate sound directly, putting your hand on that piece of vinyl, moving it backwards and forwards and hearing that kind of concrete chisel sound come out, as Malcolm McLaren used to describe it, is a wonderful feeling. I don’t use decks so much any more but I’m still really into scratching, and then those technologies can be brought forward, and I think it’s good to take the skills that we learned with the old kit and transport it onto modern technology. So yes, I’m a vinyl lover, I’m an analogue lover, but I’m also a lover of anything that can be used to make sound and make art with, so I have my favourites but I’m open to anything. For both Matt and Jonathan, it’s all about enjoyment. Another thing that’s important, and which has always been a feature of their work, is customizing their kit and finding new things to do with it. We’ve done some circuit bending and customization. One I’m particularly proud of is the audio-visual mixer idea. In the 90s we developed a software called VJamm which was a sort of audio-visual piano and so you could trigger samples from percussion pads, audio-visual samples. If you know our piece Timber you probably know what I mean. Short, percussive audio-visual samples like a guy hitting a tree or a chainsaw, sequenced together. Now we wanted to be able to do that live, rather than put it together in Adobe Premiere, which is how Timber was made. So we wanted a real-time instrument and VJamm was that instrument and then at some point it occurred to me that while it was OK to be able to play these samples, by analogy with DJing, what I needed was a mixer that could handle audio and visual streams. Matt came up with a great idea, to hack together some kit to make an innovative video mixer. I got a video mixer, which was an old Panasonic AV5 something that I think they sold thinking that people would use it to edit wedding videos, and we were using it for VJ-ing, mixing two video sources together, crossfading between them, which was a real thrill in itself because it was like, hey, this is like DJing. I thought well, to make it even more like DJing I need a proper crossfader. So I asked a friend of mine and he customized the mixer for me by replacing the crossfader with an external control input which which we then took from a DJ mixer. So we literally took the DJ mixer, bolted an extra crossfader onto the existing crossfader and so you had one slider that you could control both these crossfaders with. One was the DJ mixer to gate the audio in and out, crossfade the audio, and one was providing a crossfade signal to the video mixer. So I could operate this with one hand and trigger audiovisual samples with the other hand, so that was a simple way to get an audiovisual mixer and at the time that didn’t exist, so we did this simple bit of circuit-bending to get the result that we wanted. I think that was possibly the first proper audiovisual scratch mixer. Coldcut’s audio visual cutups include this political video for the UK 2002 election. It inspired a genre that informed Chris Morris’s work, and is an activist classic. The video mixer is not the only radical gadget Matt’s dreamed up. We also made a device called the Deckstractor, which consisted of taking the guts of a mouse, a computer mouse, out and mounting it on a steel arm, like a deck tone arm so adding this extra arm to a turntable, so that the mouse movement, the mouse wheel, would track the movement of us scratching a record backwards and forwards. 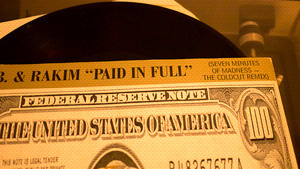 This was another way to take the DJing techniques and graft them onto digital technology, and in the interim, solutions like Traktor and Serato, it’s called time-coded vinyl, have taken that idea further. So there’s a couple of examples of circuit bending from the Coldcut camp. Matt’s done a run through of Journeys by DJ - Virtual DJ, which is a great watch. He’s wildly underselling his skills, but it’s clear they all play a vital part in the great music and more, that he makes and releases. I must say that I used to do a bit of electronics but I was never really good. I’m not really that good at anything, actually, I just know enough to do a bit of computer programming, a bit of electronics, a bit of drum programming, but nowadays it is possible for one person to take different bits of skills and converge them together, perhaps a bit of jack of all trades master of none but it is nice to be able to have a dabble in lots of different areas and I think for me that’s been very important for the kind of creative path that I’ve followed. The latest innovation from the Ninja camp is Ninja Jamm, an amazing app with a great design, that lets anyone try their hand at music making and experimenting. Matt’s been previewing it and it’s due for release this Spring. So we’re developing Ninja Jamm to give everyone a chance of playing with electronic sound - having the enjoyment of just playing around with sound which Jon and I have always felt has been a big part of motivating us to do what we do; as non-musicians we appreciate that there’s a lot of barriers that we’ve come up against that stop us expressing ourselves freely with sound. And so we’ve wanted to design tools, sometimes we call them play tools: toys and instruments that just let us play with sound. Ninja Jamm is the 21st century remix of those ideas which we’ve been developing for twenty years or so. And it’s now got to a point where the platforms are there to enable us to make this and distribute it in a way that wasn’t possible before. So that’s a big part of our motivation for Ninja Jamm. 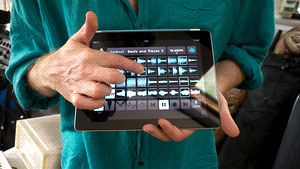 Here’s a clip of Matt showing leading electronic producer and musician Amon Tobin round the app. Matt and his team wanted to make the app easy to use but not so simplistic that it gets boring. Ninja Jamm is pretty different to any other apps that are out there. I think Ninja Jamm has a unique mixture of content, playability and depth; also there aren’t any other labels that have really put out apps that let you mess with the music that’s on the label - it’s artist-driven, basically. When you get a pack on Ninja Jamm, you’re starting off with some sounds from a Ninja Tune artist - Amon Tobin, Bonobo, Mr Scruff, people that our fans already know. With a lot of apps out there, the content’s not very good because it’s just kind of generic stuff. Ours comes with the Ninja hallmark of dope audio. And so I think that’s quite a big pull - people do know our artists and they all have an identity and that’s manifested in their tune packs on the app. Here’s more of a taste of Amon Tobin, one of the artists whose sounds will feature on the app. I think the app’s quite powerful, and what we’ve endeavoured to do is take some of the best kind of studio tricknology, the best effects, instruments and techniques of modern electronic music and then put them in really easy to use modules, so you have the enjoyment of using them without really needing to know what’s under the hood. A lot of effects, for instance, they have a whole load of controls that you really have to know what you’re doing to operate. I don’t know a lot of the time, I tend to be more like, I’m just going to mess around until I hear something that sounds good, so that is… feeding back to what I was saying before, to make it powerful but very easy to use. And that’s a subtle balance because you don’t want to make it too complicated but you don’t want to make it too trivial - I think we’ve got the balance right there. I hope so. While Matt agrees that there are other interesting apps around, he thinks that Ninja Jamm is taking things a step or two further. There are also a lot of other apps out there that are like cut down studio software apps. If I want to mess about on the subway, great, but I’m probably not going to make anything serious there. So I think quite a lot of apps are trying to be like full versions of music-making software but you can’t really do that on these devices. And then a lot of other apps have interactivity and music built in but the interactivity is kind of a bit bolted on top. Bonobo is another of Ninja Tune’s artists whose work will be available via Ninja Jamm. Here’s ‘Heaven For The Sinner’ featuring Erykah Badu taken from Bonobo’s album ‘The North Borders’ released on April 1st. Matt hopes that the app is going to appeal to music lovers of all ages. I think Ninja Jamm’s aimed at everyone who’s a music lover. I’d like to think that children of all ages will enjoy it and we’ve been getting some good reactions from lots and lots of different sorts of people. Maybe it’s more of youth thing, but I know there’s a lot of older Ninja and music heads who will dig the opportunity to interact with music. People that love music, have wanted to have a go at DJing, or making music, but have found the technological barriers to that have put them off - I think they will jump onto Ninja Jamm because it’s very instant. I think that more experienced users will also enjoy it because it puts a lot of power into quite a compact interface, and you can dig deeper into it and really get quite creative with the possibilities. It’s also going to be up to the individual user to decide how far they want to take things with the app. The initial version, which is the first version, is free. And that’s designed to be used with Ninja packs, and this is how we are hoping that we might make some money. So it will probably come with two free packs: two free tunes to mess around with, and the app’s free itself, and if you want to have other packs then you buy them from the in-app purchase store - they’re very reasonably priced. In the future we would certainly want to offer a more, let’s call it pro version, and the number one feature that we realise totally that people want, is the ability to load your own samples. That is a killer function, I know it is. Matt showed a version of the Ninja Jamm app at London’s Music Tech Fest 2012 as part of a talk about apps being the 21st Century music format. He also gave it to music hackers there to try out, and got a great response. Matt’s still got lots of ideas to explore and wants to hear what other people would like to see too. I also have a long, long list of features which would go into future versions and we’re open to suggestions on that as well but believe me that we’ve already got some pretty good ideas and we are going to roll them out as soon as we can, and that means as soon as we get some money back from selling some packs. So support us and we’ll support you! It’s a work in progress and, as we claim, we deliver next generation beatnological manipulation. We will never stop developing these ideas and bringing them forward to people, but the pace of that will be controlled a bit by real world parameters. But it’s a promise, that we aim to give people the best toys to play with, and that’s a solid Ninja mission statement. For the latest news on Ninja Jamm, due to be launched in Spring, check here or follow @NinjaJamm on Twitter.